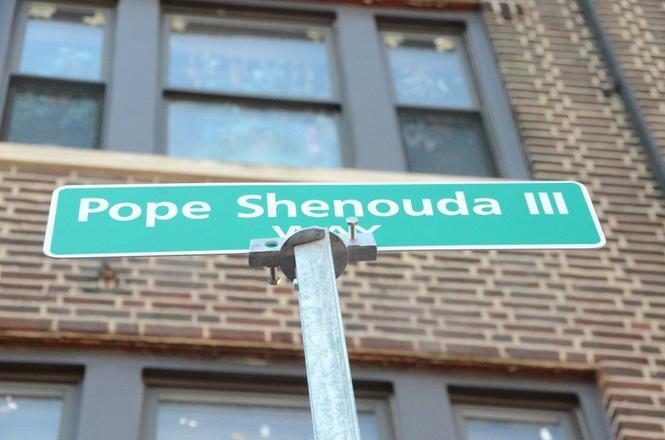 Hundreds of Coptic Christians crowded the intersection of Bergen Avenue and Vroom Street in Jersey City yesterday afternoon, to witness the unveiling of a street sign in honor of Pope Shenouda III. Prior to the unveiling ceremony, roughly 400 people packed into St. George & St. Shenouda Church, at 835 Bergen Ave., for a standing-room only ceremony with prayers and hymns in memory of the Pope. Shenouda was the 117th pope and Patriarch of the Orthodox Coptic Church based in Alexandria, Egypt. He served from 1971 until he died on March 17 this year and in that capacity presided over several million Copts worldwide. When Shenouda became the church’s leader in 1971, the only Coptic Church in New Jersey was St. Marks on West Side Avenue. Now there are more than 20 churches in the state, church officials said. There are also 30,000 Copts in the city, said Maggi Khalil, a community organizer and Jersey City municipal prosecutor. Ward E Councilman Steven Fulop co-sponsored the council resolution to have the intersection named for Shenouda with Ward C Councilwoman Nidia Lopez. “We gather proudly and faithfully to remember the longtime spiritual leader of millions of Christians in Egypt and around the world,” Menendez said, adding that he’s called on the current government of Egypt to respect the right of Copts to worship in freedom.